Enjoy the top 1 famous quotes, sayings and quotations by Elliott West. 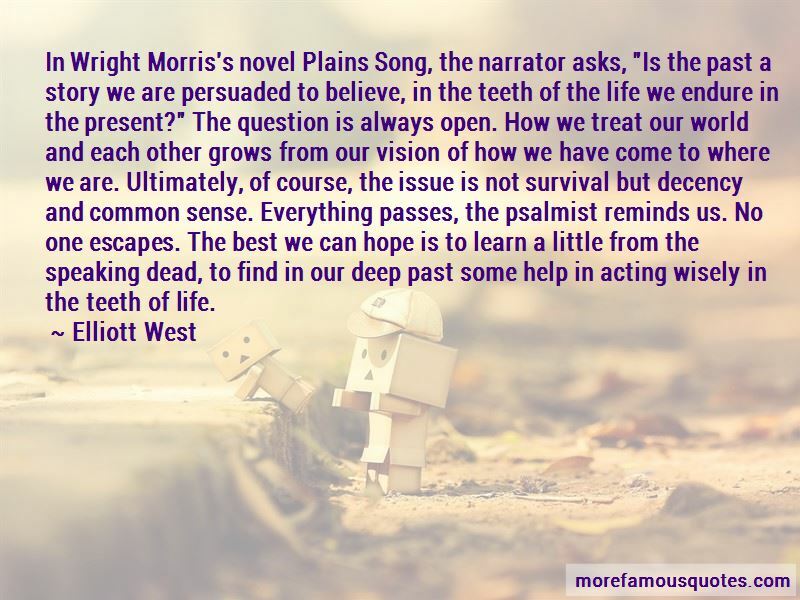 In Wright Morris's novel Plains Song, the narrator asks, "Is the past a story we are persuaded to believe, in the teeth of the life we endure in the present?" The question is always open. How we treat our world and each other grows from our vision of how we have come to where we are. Ultimately, of course, the issue is not survival but decency and common sense. Everything passes, the psalmist reminds us. No one escapes. The best we can hope is to learn a little from the speaking dead, to find in our deep past some help in acting wisely in the teeth of life. Want to see more pictures of Elliott West quotes? Click on image of Elliott West quotes to view full size.